Between the summer deluges and the skin drenching humidity today, it's not be a pretty picture in Manhattan. 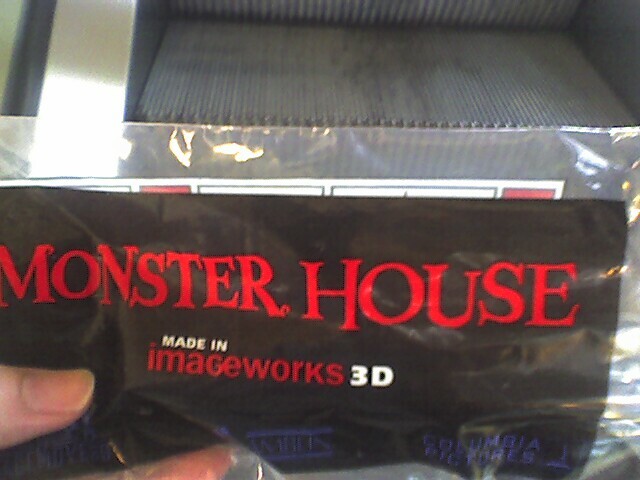 But not to worry, Cinecultist spent much of the afternoon indoors at a screening of the new kiddie animation film, Monster House. 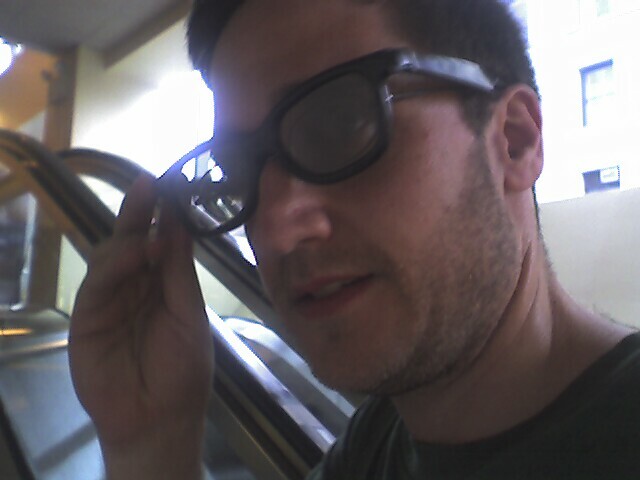 Lured to Union Square by Josh, we had no idea that we were actually signing up to see Monster House in...wait for it...3-D! That's right, the tickets were even more pricey than usually ($12 sodding 50) but we did get the cool commemorative glasses pictured below. They're made by this company called Real D, and they remind users on the packaging that while they may look like sunglasses made popular circa Back to the Future, said glasses will not protect the eyes from the sun. Here's a picture of Josh modeling them. Snazzy, right? Note that they fit adults and can be worn over your own glasses, which is a bonus for ocularly challenged parents. The movie itself was actually pretty cute, about three pre-teens who suspect that the house across the street might have a life of its own. Particularly Maggie Gyllenhaal, as the voice of the babysitter and Steve Buscemi, who voiced the cranky old man who lives in the scary house, were quite good. Also, the children characters, D.J., Chowder and Jenny were funny without being annoyingly precious. But of course, the real test of a good kids movie is an audience filled with kids but who keep quiet because they're into the flick. The filmmakers of Monster House should be happy to know there was nary a peep during our screening. Also, according to the trailers which were also in three dimensions, they're planning to rerelease Tim Burton's The Nightmare Before Christmas in this format in October. That could make for a pretty fun Halloween viewing experience of a total animation classic.